Unfortunately, Juju’s has closed its doors for good. 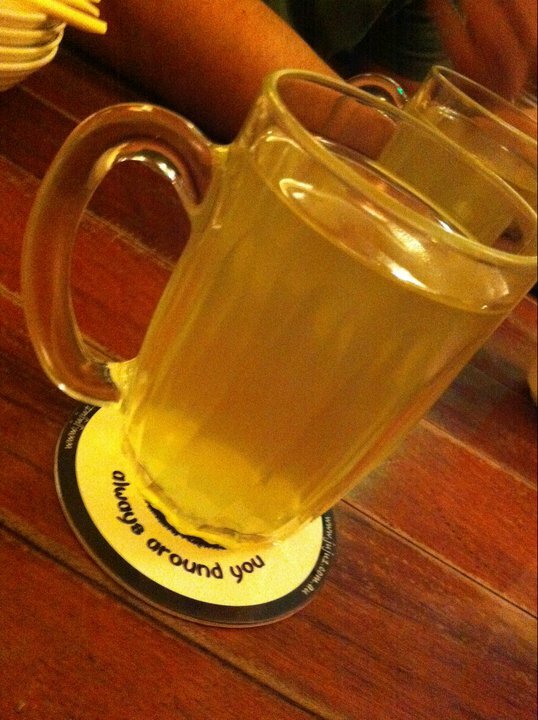 There’s nothing better to close off the year with one of my favourite Japanese restaurants in town, Juju’s. This is a really nice place to have dinner with friends and families. They also have karaoke on weekends. There are no chairs in this restaurant. They try to emulate a tatami with a twist. You will still be sitting on wooden floor, but there is legroom under the table. Getting a decision on which food to order is not a simple task. 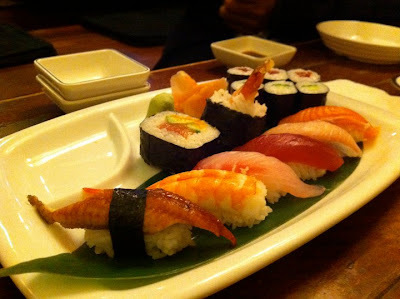 There are a huge variety of dishes on the menu and we decided to have some that we can compare the taste with. They have quite a few options for beverages, but this time I sticked to the good old Hot Green Tea, Genmaicha. 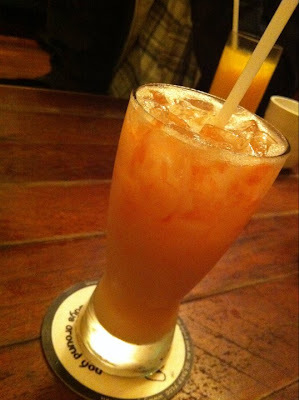 We also ordered Grapefruit Yakult. 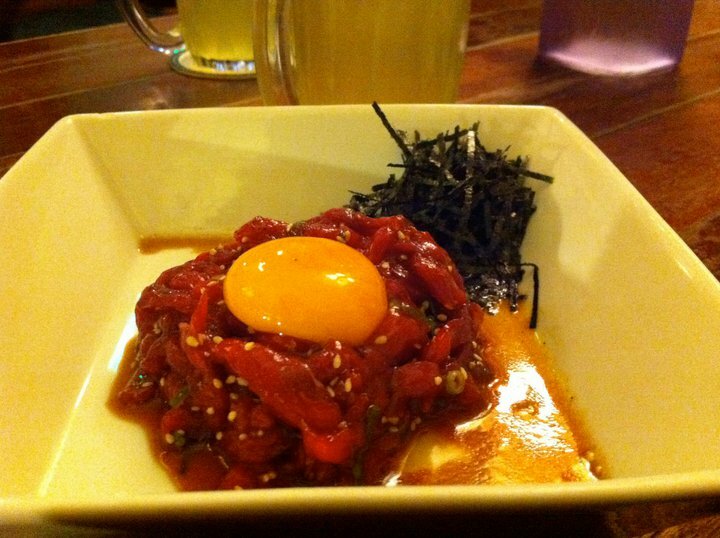 For the first dish we had Yukke. It is raw slices of marinade beef with egg yolk. Unfortunately the beef was a bit warm and did not taste fresh, but it wasn’t disappointing. Then came the Sushi Platter. It was the exact opposite of the Yukke. It was a decent-sized platter with nice assortments of Sushi. 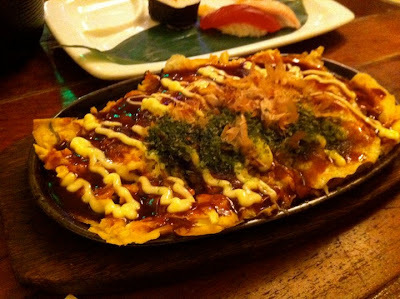 The unexpected dish came next, Okonomiyaki. It was massive! 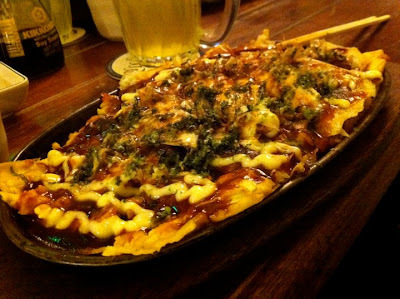 Okonomiyaki is kinda like a savoury pancake with some vegetables and any kind of meat, then sprinkled with shredded seaweed and generous pour of Japanese Mayonaise. It might be too big for one person to finish. 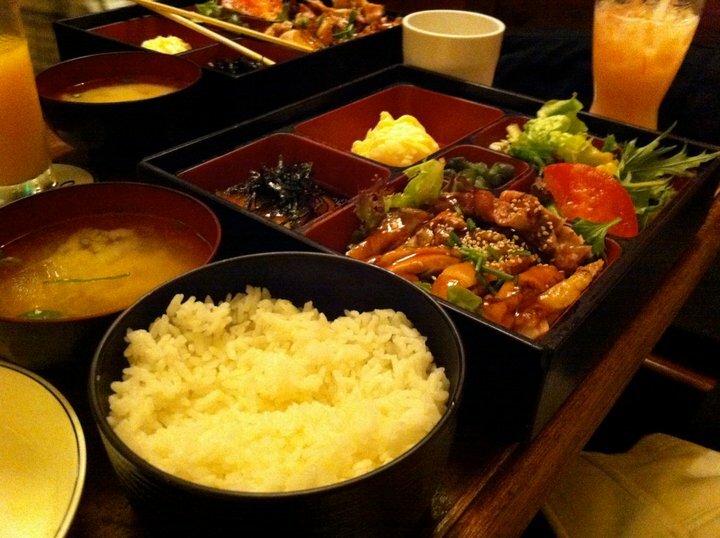 The Bentos are definitely value for money as well. 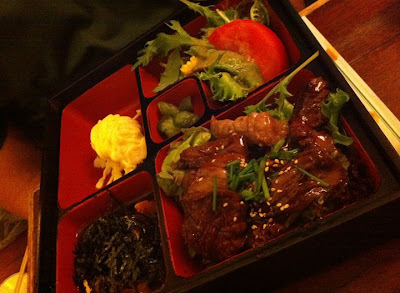 Whether it was Chicken or Beef Teriyaki Bento, they come with a big bowl of rice, miso soup, a portion of mashed potatoes, salad, agedashi tofu and Japanese pickles. The teriyaki was really nice. However, apparently we didn’t try the chef’s signature dish, Mentaiko Basa. Last, but definitely not the least, are the dessert. 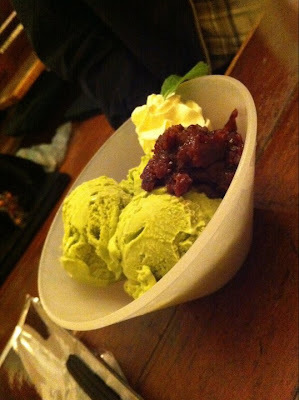 First one was the all-time favourite, Green Tea Ice Cream. You’d expect that in any good Japanese restaurants, the ice cream and red bean would taste pretty similar. 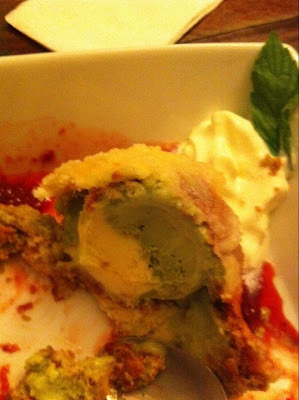 Our next dessert was rather unconventional, Tempura Ice Cream. I’ve never seen a dessert like this before. 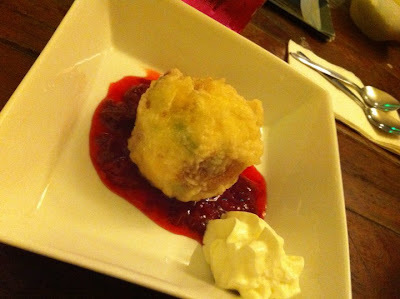 Green tea and vanilla ice cream covered in tempura batter with a hint of coconut put over raspberry sauce. It was a combination of hot and cold dessert. The final verdict: It was a really nice place to have a good meal, and possibly go to one of the nice bars nearby afterwards. 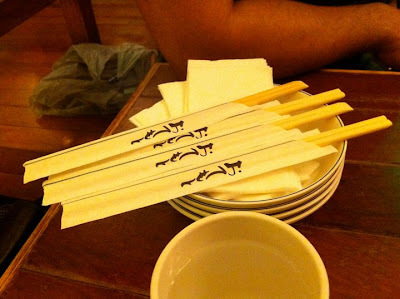 The dishes were nice and there was a quite innovative in Tempura ice cream, with the exception of Yukke. It was nice, but unfortunately I’ve tasted a much better one in a similar restaurant. 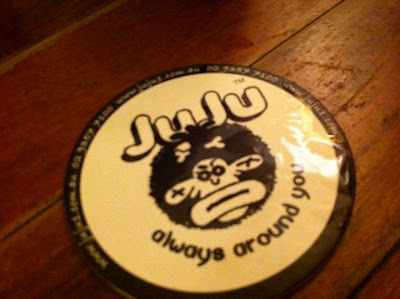 JuJu is located in Sydney’s red-light district, Kings Cross. The restaurant is located at the same block as the big Coca-Cola sign (http://en.wikipedia.org/wiki/Coca_Cola_Billboard,_Kings_Cross), one of Sydney’s infamous landmarks. This restaurant is also pretty famous for a waiter who looked like Brad Pitt (seriously! ), although when we were there the last time, he wasn’t there.